I arrived in Chiang Mai at the beginning of my trip with high expectations – and it didn’t disappoint. In fact, it quickly became one of my favourite places on Earth. 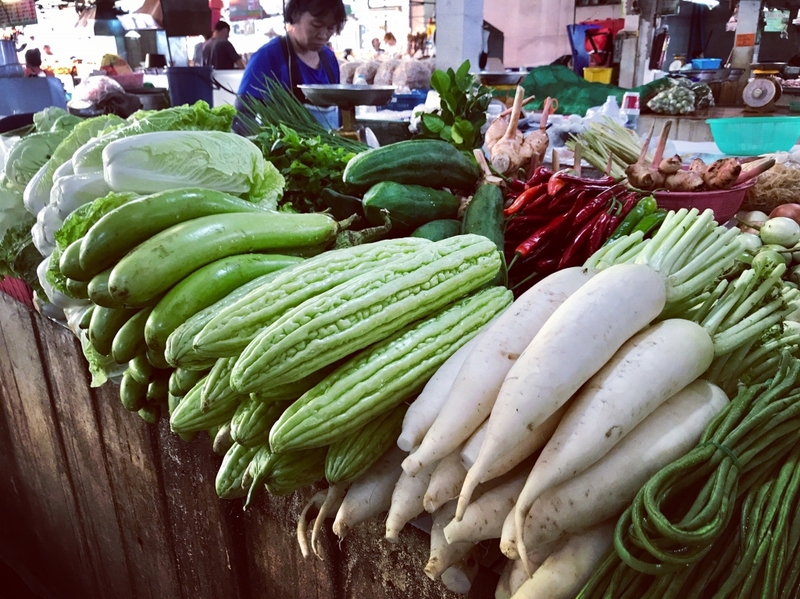 From colourful temples and chaotic night markets to cosy yoga studios and quirky vintage shops, Chiang Mai has everything a culture-hungry, vegan foodie traveller could possibly want. 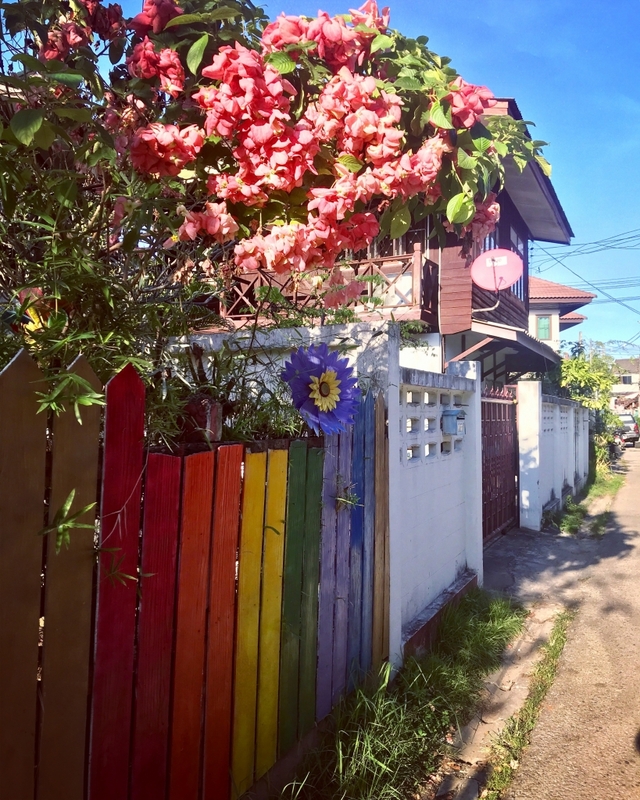 It’s a place where you can lose yourself in the quaint and sleepy side streets, where the soft jangle of wind chimes and the earthy musk of incense floats in the air, and where the laid-back atmosphere invites you to let go and slow down. It’s the kind of place that, if you’re anything like me, you’ll probably never want to leave. And not only is the city brimming with local charm, but it’s also home to some of the best vegan food I’ve ever tasted. Whether you’re looking for Western, macrobiotic, or authentic Thai dishes, Chiang Mai has it all. I was lucky enough to spend a whole week in Chiang Mai, but for those on a tighter schedule, here’s an itinerary based on my favourite four days. After reading the reviews online, I knew that I had to visit Elephant Nature Park. Located in the jungle about 90 minutes north of Chiang Mai, the park is a place where visitors can feed and interact with rescued elephants in their natural environment. Unlike many of the other ‘sanctuaries’ that allow visitors to ride the elephants, Elephant Nature Park is a responsible and ethical rehabilitation centre that truly cares about the welfare of the animals. It was heartbreaking to learn of the abuse that these beautiful creatures have suffered at the hands of humans, but equally inspiring to see how they’re now so well cared for. If you’re an animal-lover looking for an authentic experience, then Elephant Nature Park is a must-do. There are a few different packages available and I chose the single day visit (2,500 THB). The price included a pick-up from my hostel as well as a veggie lunch – and of course, all proceeds go towards supporting the animals, the environment, and the local community. Like the name suggests, Dash! is a restaurant inside a traditional teak building. Here, I had my first taste of the northern Thai dish Khao Soi, a yellow curry base topped with crispy fried noodles – heaven! And as I sipped my Chang on the dimly-lit terrace, listening to live acoustic guitar and talking about life with three lovely girls that I’d met at the elephant park that day, I couldn’t help but feel overwhelmingly grateful. 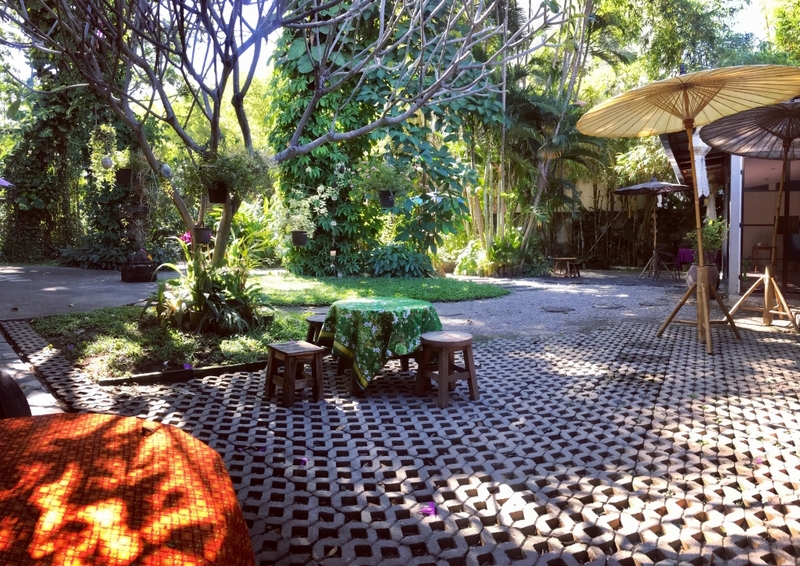 I ate brunch at Vegan Heaven and its sister restaurant, Taste From Heaven, three times during my week in Chiang Mai. I ordered the vegan breakfast with tofu egg, vegan bacon and sausages, baked beans and fried potatoes, and the vegan bacon sandwich, which comes with a deliciously creamy avocado sauce. Although I’m slightly ashamed at myself for it, after a few days of having fried rice or pad Thai for breakfast, I was craving Western breakfast foods – and these restaurants hit the spot. They also had a great selection of vegan iced teas – yay! What better way to recover from overeating than to lay in a comfy chair and watch the world go by while getting your feet rubbed? There’s no shortage of massage parlours in Chiang Mai, and from what I saw, they’re all a similar price (200-300 THB for 30 mins or 400-500 THB for one hour). I’d heard about the Chiang Mai Women’s Correctional Institution where female inmates give massages to the public as part of their rehabilitation programme, but unfortunately I didn’t make it there. This is a huge market which stretches the length of what feels like the longest street in the world. Here, you’ll find an array of stalls, selling everything from delicious fruit shakes, street food and snacks, to beautiful clothing, souvenirs and home accessories. There wasn’t much vegan food to choose from, but I eventually found some tofu summer rolls, vegetable gyoza, and black sticky rice pancakes. I also picked up a few pairs of elephant pants – which are like pyjamas, except it’s socially acceptable to wear them in public – for about 200 THB each (sorrynotsorry). The market closes at midnight, but I’d recommend getting there at around 17:00 to beat the crowds. Having already ticked everything I wanted to do off my list, I set off to explore the city with no real plans. 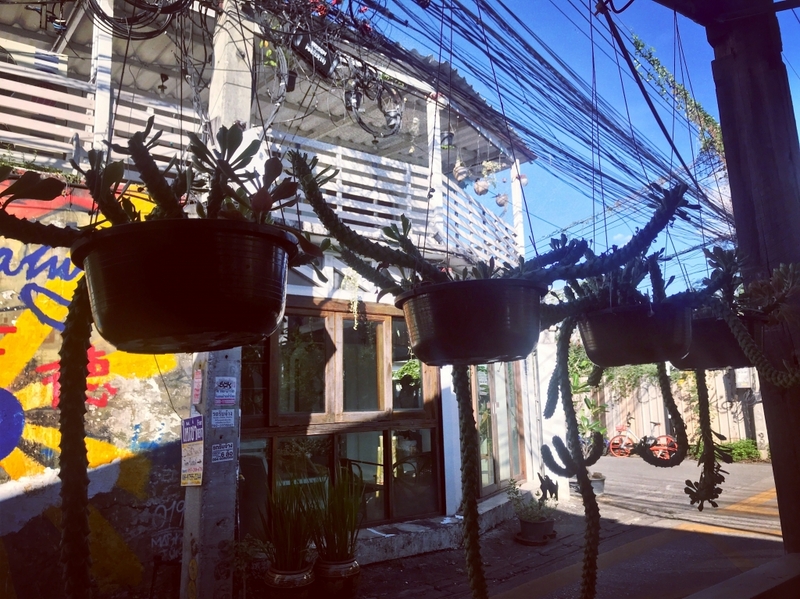 I remembered hearing about Free Bird Café – a café where proceeds help to support a local refugee charity – and so I took a Grab (70 THB) from my hostel to the trendy neighbourhood of Nimmanhaemin in search of some brunch. How cute are the salt and pepper shakers?! 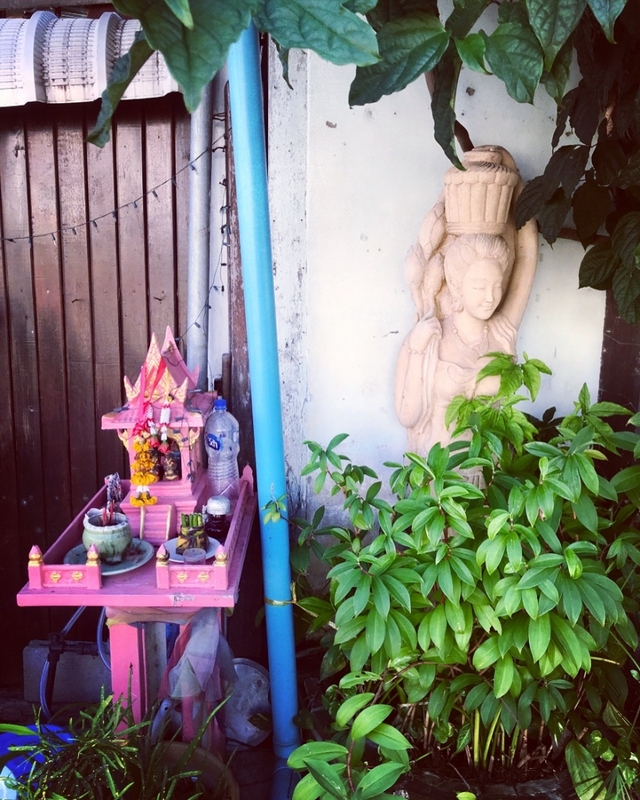 After browsing the charity shop inside the café, I chose a seat at a rustic wooden table next to the water feature in the sun-soaked garden and ordered a Thai iced tea. They’re typically served with sweet milk, and although you can order them black, to me they taste much better with milk. So I was super pleased to find a vegan version with almond milk on the menu! I also ordered the fried tomato and houmous sandwich with a side of potato hash. 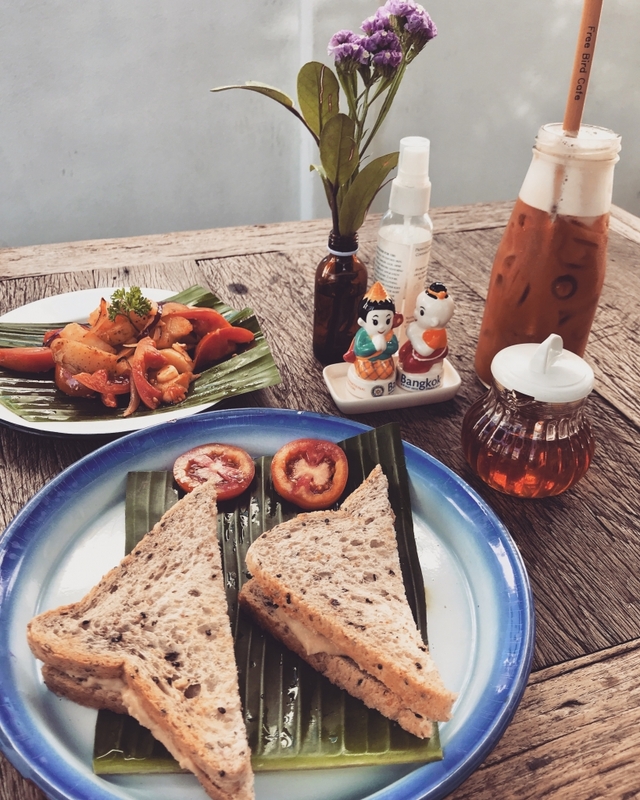 Maybe it was the fact that I was starving, but I’m pretty sure that this brunch was one of the best I’d had in Thailand (and maybe even the world). After brunch, I decided I deserved some relaxation – after all, all that eating and doing nothing was exhausting – and I headed to The Yoga Tree, a tranquil oasis just inside the Old City walls. It’s easy to see why this place gets so many great reviews. Set in lush gardens, the studio itself is a gorgeous traditional building with teak floorboards and floor-to-ceiling windows. I took the 13:00 Yoga and Meditation class with Nok (300 THB). There were only two of us in the class, which meant that we got plenty of one-on-one instruction, and I left feeling decidedly zen. As I mentioned before, you can easily lose yourself for a few hours in the charming and folksy streets of the Old City. Here, you’ll find an eclectic mix of ornate temples, old wooden and new brick houses, cosy guesthouses and luxury hotels. 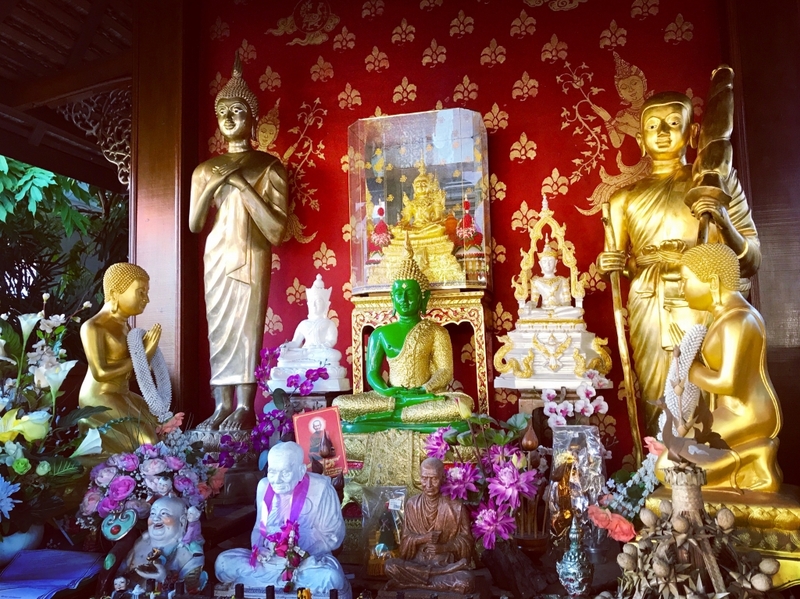 You’ll find shrines draped in Phuang Malai (flower garlands) and incense sticks, earthenware pots full of water lilies and goldfish, lanterns adorning the trees, and hanging baskets everywhere. You’ll find mechanics repairing scooters in their front rooms, locals selling street food outside their homes, and monks sweeping the pavement in their flame-coloured robes. On this day, I was lucky enough to arrive at Wat Chedi Luang, an ancient temple on one of the bustling main roads, just in time for the evening Buddhist chanting. I watched spellbound as bare-footed and shaved-headed monks both young and old bowed before the grand golden Buddha, reciting their mantras from memory. Then, I took part in the daily ‘monk chat’, where I listened as a teenaged boy shared his experiences as a Buddhist monk with foreigners. It was truly a once-in-a-lifetime experience, and an absolute must-do when in Chiang Mai. I took a quick stroll along the Sunday Walking Street on Ratchadamnoen Road next door to Wat Chedi Luang, which was just beginning to come alive at 16:00. As I’d been to the Saturday market the night before, I decided to give it a miss, and I ducked into a nearby organic massage parlour on my way back to the hostel for some more well-deserved R&R – because like I said, holidays are exhausting. Aum was a little bit tricky to find, and involved a walk down a dark and slightly spooky alleyway, but it was worth it. The Thai food menu is extensive and I was spoilt for choice, but eventually I settled on the tofu and green bean stir-fry with wild rice by recommendation of the waitress. It was rich, fresh and so tasty. 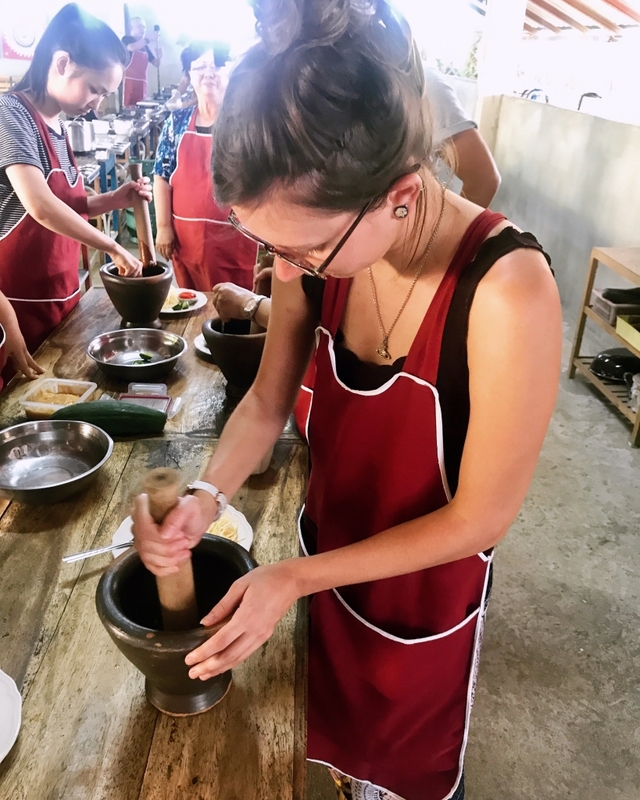 I knew that I wanted to do a cooking class in Chiang Mai, and I’d read about Sammy’s Organic Thai Cooking School being one of the best, but I wasn’t able to book online. Once I’d set up my Thai SIM (500 THB for 30 days of unlimited 4G, available from 7/11 stores), I phoned to book my place a couple of days in advance. From the minute Sammy answered in his sweet and endearing manner, I knew it would be a good day – and I was right. Sammy picked me up from my hostel at 08:00 before collecting the rest of the group and taking us to a local market on the outskirts of the city. Here, we chose our dishes from the menu – mine were pad Thai, green curry, papaya salad, tom yam soup and banana in coconut milk. We were given some time to explore the market, and after snacking on a fresh coconut and some guava dipped in sugar, we were shepherded back to the truck. The drive took about an hour and we crossed the Mae Ping river before leaving the city and passing through the sweeping rice paddies. When we arrived at the farm, Sammy showed us around his garden, where we learned about traditional Thai ingredients. We spent the day cooking, eating, laughing, and napping in hammocks overlooking the fields, and I left armed with a recipe book and a whole new enthusiasm for cooking. So if you’re after a fun, engaging and vegan-friendly cooking class, then Sammy’s is the one for you. I visited Chiang Mai during the second week of December 2018. The temperature was around 25 degrees celsius and the weather was a mixture of sun, cloud and – as is inevitable in Thailand – rain. The city was busy but not too crowded, and although I booked my accommodation and flight from Bangkok in advance, I had no trouble when I decided to extend my stay. Nestled in a residential street about a 10-minute walk from the edge of the Old City, I found my home away from home – OnPoint Hostel. Not only was it spotlessly clean and comfortable, but it also had a big, clean swimming pool – perfect for cooling off after long, balmy days. Just down the road you can find one of the best local restaurants, Airbus, as well as Kad Manee night market. The owners, Tye and Chris, are some of the loveliest guys I’ve ever met and will go out of their way to make sure you have the best experience possible. And I did. Every now and again when travelling, you can find yourself sharing a space with people from all over the world, and together you create something magical. This is what happened for me at OnPoint. And it might sound cliché, but the memories I made here will stay with me forever. As I didn’t trust myself with a scooter and I hated haggling with tuk-tuk drivers, I relied mainly on the Grab app to get around the city. But if you’re a confident rider, I’d definitely recommend hiring a scooter, as there’s so many beautiful places to visit in the surrounding countryside.